I think you can say that all young children are loved in Thailand in away not seen in the west. It is part of what makes Thai people the happy people they are. They are very tolerant towards children and go out of their way to play with them. Restaurant staff at even the most formal setting will stop to smile and maybe tease a young child. Thai people are also very fascinated by children with fair hair. Please note that it is normal for Thai people to play with strange child uninvited and give her or him a hug and then carry on. Strollers, carry cots, prams are becoming an increasingly common sight amongst Phi Phi Hotels in the main village. Take a walk on any given night in high season and families with infants can be seen. Now in July 2008 there are many families on the island, getting a vacation before the students and university graduate break up and start their travels. The popular family resorts are Holiday Inn Phi Phi Island, Phi Phi Natural Resort, PP Erawan Palms Resort, Phi Phi Island Village Resort And Spa, Phi Phi The Beach Resort, Paradise Resort, Andaman Beach Resort, Phi Phi Hotel, JJ Bungalow, Phi Phi Banyan Villa and Phi Phi Island Cabana Hotel, as these all have easy access and are in a naturally child friendly environment compared to the other resorts. Although there are no cars there are trolleys and the occasional motorbike with sidecar so care must be taken. In the main Phi Phi village the paths are paved with cobbled bricks which is near flat. Some paths are just sand especially in front of Phi Phi Cabana Hotel and up at the resorts at Laem Tong. For these hotels the strollers with bigger and wider wheels work better. The sun can be a problem for some children, especially from 10.30 pm to 15.30 pm when the sun is at it’s most direct and hottest. Infants will need shade, toddlers sun cream but all will need some protection in the form of clothing and hats. 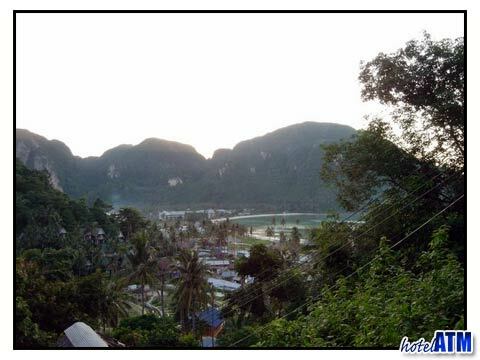 Coconut trees are everywhere on Phi Phi Island especially in the main village and Loh Bagao and Lanah Bay. Make sure you check the tree for the nuts if you leave the stroller in the shade. The better hotels remove coconuts on their land. Mosquitoes are not a major problem in the hotels and resorts themselves but as Phi Phi Island is an outside kind a place, sunrise and sunset is a time to look after the children. The mosquito sprays can be bought at the Phi Phi island pharmacies but it is probably better to buy them before you arrive.